Welcome to Sport Studies at Reinhardt University. all in the heart of the University's recreation and sport facilities. we are likely to offer something for you. Please take a few minutes to discover more about our program, its people, and its offerings. If you have any questions, please feel free to call or email. Interested in the scholarly study of sport or in preparing for a sport-related career? If so, the Sport Studies program at Reinhardt University might be just the degree option for you. In our program, students study sport from a broad, cultural perspective and also prepare themselves for a variety of career opportunities in sport-related fields. As a Sport Studies major, you might find yourself discussing the role of sport in American society one week, and sitting in the dugout at Turner Field as part of a class tour the next. A unique aspect of the Sport Studies program is an extensive internship requirement that allows students to earn academic credit while gaining real-world experience. 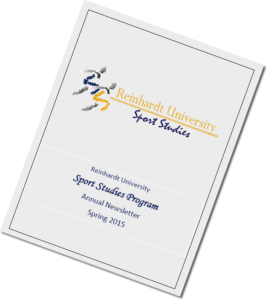 Scholarly study combined with practical experience: The Sport Studies program at Reinhardt University. The Sport Studies program is a flexible, interdisciplinary degree designed for students interested in studying sport from a broad cultural perspective, or for students interested in pursuing career opportunities in sport-related fields. Majors choose either a Sports Administration or a Sports Communication option. The program includes an extensive capstone internship experience (12 Credits-600 hours), and an introductory practicum field experience (3 Credits-150 hours). The Sport Studies Program is designed to develop graduates with a broad cultural perspective of sport, with practical skills suitable for employment in sport-related settings, and with ethical and moral characteristics suitable for assuming leadership roles in contemporary society. The Sport Studies Program (SSP) is an undergraduate degree track leading to the Bachelor of Science in Sport Studies. Sport Studies majors complete the college General Education Curriculum, the Sport Studies Core, either the Sports Administration or Sports Communication concentration, and the electives requirement. See our Program Advisement Sheet for information about particular requirements. The Sports Administration option consists of 18 credit hours of Business (BUS) courses, while the Sports Information option consists of 18 credits of Communication (COM) courses. Majors are strongly encouraged to pursue a Minor in either concentration. The Sport Studies Practicum (PED 380) and Internship (PED 480) require extensive work experience in a sport-related setting. Open the Newsletter - It's a must read for all Sport Studies Majors and potential majors ... find out how to Make Yourself an Invaluable Sport Studies Major!